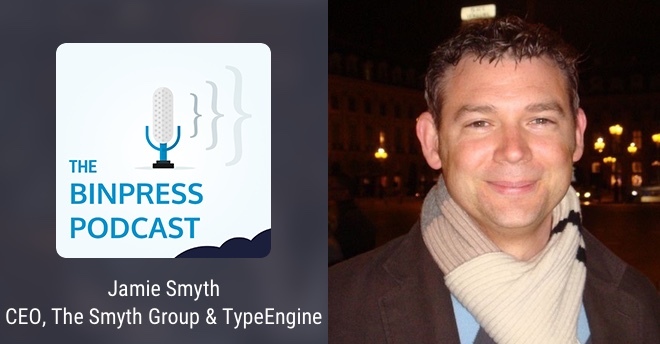 This episode we talk with Jamie Smyth, CEO The Smyth Group and TypeEngine, a platform and service for building tablet-native publications. Jamie covers how Hurricane Katrina was the catalyst for his agency, why having a dedicated contact person is vital for client work, what it’s like to working as a programmer in the fashion industry, and much more. Alexis: Jamie, thanks for taking time out of your schedule to come on the podcast. Jamie: Yeah, thank you for having me. Alexis: So before we start into the Smyth Group and TypeEngine, tell us a bit about your background. Jamie: I’m a nerd. I was born in New Jersey, raised in Louisiana. Yes, they have computers in Louisiana [chuckles]. I lived on a small island off of Seattle for quite a while and from there I moved to New York. Alexis: High five for both of us [chuckles]. Jamie: [Chuckles] Right it on. So that’s it. Alexis: After having been to Seattle for about a month and a half this spring, what island off to Seattle did you live on? Jamie: Oh, right on. I lived on Vashon Island which is pretty much the closest one. You have to take a boat to get there. It’s just a wonderful, wonderful place to live. Alexis: I went to one of the islands there. I can’t remember if it was that one or not but it was about maybe half an hour or a forty-five minute boat ride. But, it was very nice. Jamie: Yeah. It might have been Bainbridge Island. Alexis: Yeah, that was it. Jamie: Ok. Anyway that’s a very popular –. Alexis: Anyway, enough about my Seattle adventures [chuckles]. How did you learn to program? Jamie: You’re going to love this – my mom taught me to program. Jamie: Yeah. My mom taught me to program when I was about 9. She didn’t know how to program but what she did was – so, I’m dating myself here [chuckles] – she bought an Atari computer and she bought a BASIC book: a book on how to program in BASIC. I’ll never forget, she hooked it up in the TV in the living room and she sat me down next to the computer and she opened the book, page one. And she just started reading the book to me. Gosh, that was in 1983. She and I got to page 50. I took to it like a duck in the water and she was just bored out of her mind. She just left me with the book and I just kept going. We spent about two or three weeks of doing it together. and then I just took over on my own. Jamie: You know, I never got the chance to ask her. She has since passed away, unfortunately, but I never asked her what made her think about it. I was always drawn to it. I was drawn to computers. I guess it’s like that for most nerds. I assume that they’re just magnetically drawn to it. So anything computer, anything with a heartbeat in it, I was just drawn to. She didn’t know what that was. I didn’t know what that was. I think that’s how she got the idea; it was from the salesman at the computer store. Alexis: Man, okay. [Chuckles] Everything went very well [chuckles]. I mean, she was ahead of her time. Alexis: Ok, you got this programming bug in you and you can’t shake it loose, how do you cope with it? How did that translate into what you studied and what you spent your time doing? Jamie: It was pretty much that. I spent middle school writing BASIC games and it quickly and naturally progresses to video games. And then, in high school, I’m very fortunate to have an excellent Computer Science teacher in high school; he made it just come alive for me. He taught me how to do it for real. So I was delivering pizza in high school and I got to be friends with the boss. This is when I was 17. And the boss was complaining about people stealing the cheese and stuff from the store. I told him, “I bet you I could write a computer program for you that would estimate – based on how many pizzas get sold and based on your inventory – how much cheese you’re supposed to have.” Because people were stealing an entire boxes of cheese. He said, “Yeah, do it. If you do it, I’ll pay you for it.” And so I was all over it; instead of having to deliver pizzas, I would sit in his office and I wrote a program for him in dBASE III [chuckles]. He would plug in how much stuff he had in the cooler, he would plug in how many pizzas and what size they had sold that day and it would tell him how much cheese and pepperoni and everything that he should have go out there and do an account and he would just be able to tell if they were stealing. He paid me 500 bucks for it. That was the first time I ever got paid for programming. And then I went back to delivering pizza [chuckles]. Alexis: So did you end up studying Computer Science or did you study something else? Jamie: What happened was my real love, my first love was actually just hard science: Physics, Biology, stuff like that. So I started LSU in Biophysics, that’s what I really, really loved and I did one semester of it. And I come to find out that I’m going to have to be married to this and it’s going to take me 15 years before I make a dime doing this. Alexis: The academic track or the professional track. Jamie: Yup. So I pulled the plug. I quit college after one semester and I just went and learned Microsoft Access on my own. I got a job doing Microsoft Access programming and that was pretty much it. I hadn’t the faintest idea what I was doing professionally and never went back to college, never got a Computer Science degree, made every mistake in the world. I did Microsoft Access development at the time for few years. And then I went on and did a bunch of Lotus Notes software development if you can believe that. Alexis: I’ve done some research here and I’ll confess that it is limited to Facebook [chuckles]. But you’ve got some interesting background here especially with MasterCard and then fashion stuff. Can you tell us a little bit about that? How you found your way into working in the fashion world, still in software though? Jamie: Sure. So what happened was I was living in New York and I was working from home as a consultant doing Lotus Notes development for a consulting company, and they were going out of business. I worked for them for three years or so. They laid me off. I just made some calls around – I forget exactly what I did – I just called a few friends, and MasterCard called one day. I’ll never forget – I was fishing one day and that this guy who I’d never heard of, he calls me and he says, “Hey, I heard you do Lotus Notes development and were consulting.” And I said, “Yeah.” And he says, “Well, would you like some work?” And, that was with MasterCard. I got to MasterCard and I stayed at MasterCard as a consultant for 2 years, I think. It was amazing. It was really good – right there at Purchase, New York. I learned all about the credit card industry; all of the scary, frightening, underbelly of the credit card industry. Interesting story about codifying your business and cross-pollination of knowledge – just in a tangent. My job was to report on a very particular business model that they have started, a particular business initiative. It depended on being able to follow a credit card transaction all the way through its life span – from the time the person swipes it until the money gets deposited into the merchant’s account. I started asking people at MasterCard who can explain to me where a transaction goes and what happens to it. It was like I was the voice crying out in the wilderness. There was nobody that understood how it all worked. Nobody. I’m not exaggerating. I finally found this old lady that lived in Minneapolis, but I met her here in New York, in a MasterCard office – an old lady. And they fly her, every Monday morning from Minneapolis to New York. In a private jet they fly her, they put her in a hotel, a limousine picks her up and drives her to MasterCard. Monday through Thursday she works at MasterCard and then they fly her home to Minneapolis every Thursday afternoon. Jamie: Exactly! She says, “Finally, I’ve been asked for someone to explain this stuff to for 20 years and no one cares.” She and I sat together for 2 weeks and she explained to me everything that happens to her credit card transactions from the time it get swiped to the time that money gets deposit in the merchant’s account. And it was fascinating and terrifying. But I couldn’t believe that that was the situation – [chuckles] that nobody in that business, that I had access to at least, understood it and could explain it, and it was validated by what she told me. I just learned – document your business processes and make sure that people understand the core of what we’re doing here. Alexis: Yeah, even if you’re working in a department that never touches that or only touches part of it. Jamie: Yeah. It was interesting. Jamie: Yeah. So MasterCard ended – it was funny, I was supposed to be there for a week and I was there for I think two years. I got all that finished up and then as it happened, another guy called me and asked me if I wanted to work for Prada, so I worked for Prada for quite a while in Manhattan. That was a very, very interesting experience. I’m not a fashion guru, I don’t follow things like that. Alexis: Well, don’t sell yourself short you are very sharply dressed today. [Chuckles] The Skype video tells me. Jamie: Oh, man. It was interesting – nothing against the fashion industry, but I’m used to hanging out with nerds who are not necessarily the type of the people that you think of when you think of a Prada fashion show. It was such an out of body experience to work for Prada. It was great; I mean, they were very professional and they take their image very seriously, but it was very, very different. They search you when you go into the building, they search you when you leave the building to see if you’re taking their designs or anything. It was amazing, it was so amazing. It was like Men in Black [chuckles]. Remember when the guy walks in to that little concrete bunker and there’s one guy in a chair –. Alexis: And a nondescript elevator. Jamie: Next to the gigantic fan. Exactly – that is exactly what it’s like to enter. It’s right next to the John Stewart Show, so coming in and out of the building I’d quite frequently get to see John Stewart. Alexis: Never stopped by to get some clothes? Jamie: [Chuckles] No, he had places to go. But, yeah, that was interesting. Alexis: So you spent time in the fashion industry and then some more software development for the fashion industry. Switching from fashion to software is just melting my brain today. But then you wound up doing The Smyth Group, which was your own thing. The story behind this is pretty interesting as far as your website has informed me [chuckles]. Jamie: Yeah, it was interesting. Like Bill Cosby says, “A funny thing happened.” I worked for Prada, I worked for Michael Kors and I worked for Macy’s and that was all here in Manhattan. As I mentioned I’m from Louisiana. She sends me an email and it’s all about – I looked at the fields and saw construction stuff. Well it turns out, she was involved in doing volunteer disaster relief work down in Louisiana because Katrina had just hit. That night, I looked at her email and I spent some time that night fixing up what she wants to get done and I mailed the scripts back to her and she calls me again the next day. The next day she says, “Is there any way that you could just come down and give us a hand for a week or so?” I’m from there and I knew all these people – it just didn’t click in my brain what was really happening down there, that my home was in a disaster state. My wife and I flew down and we literally just walked into a disaster zone. Many, many of our friends were just volunteering their time, working night and day, just sleeping on the floor, under a desk and then they would wake up and keep working. None of them were software developers but they were trying to scrape together a simple software to manage materials and reconstruction efforts and volunteers and assignments and rooming and food and just all this stuff, and they didn’t have any software development talent to help them. There was one lady that had come from California to help and there was a great, big, bouncer-looking guy that was standing in front of her, preventing anyone from talking to her while she coded because everybody was going to her, asking her to do stuff. So we came back to New York, sold everything and we have moved down to Louisiana into a disaster zone. We did volunteer disaster relief for the Katrina relief effort all the way from Texas to Alabama for four years – well three and a half years, something like that. It was all volunteer work. At that time, I still had my client that I was trying to work for from there and that was fine, and that was my life. We gathered more people. More and more people started coming to help us write software to manage all the stuff. I just kept getting more and more clients and hiring more and more of my friends. We had to have a company name so I called it The Smyth Group, and that was it. Eventually, disaster relief work ended and everybody went home. I moved out to Seattle and everybody else moved back to wherever they were from. I decided to keep it remote; I wasn’t going to let go of the people that were working with me. Alexis: I am very happy that you just said your last name because I would have continued pronouncing it ‘Smyth’ incorrectly throughout the rest of the interview. Jamie: No, it’s ok. I’ve been answering with Smyth my whole life [chuckles]. Alexis: Smyth is better, by the way. It sounds much cooler [chuckles]. Jamie: Yeah, Smyth. So that’s the story. Alexis: I could ask you a whole lot of questions about how the working on the relief effort one and on freelancing – not just freelancing but formalizing it into the Smyth Group, the agency. But then we’ve also got TypeEngine, so I’m going to try and cram in as much as we can here. How did the TypeEngine come about while you were working at the same time on the Smyth Group? Jamie: So TypeEngine. Man, TypeEngine is an interesting thing. We were all clients all the time. We got really good at taking good care of our clients; I mean, the hallmark that we developed was always that we really, genuinely care about our clients and the success of what we are doing for them. It’s not just the paycheck. So we got good at doing that, and we started getting clients that were in the media sector. We started doing mobile apps and we started getting clients that were wanting us to do things regarding publishing or newspapers, magazines, TV stations and stuff like that. It just about like a continuously released, periodically released, updated information into mobile apps. And my creative director said to me, “There is nothing out there that makes this nice.” It was around that time that Marco Arment came out with a magazine that was actually called The Magazine, later sold to Glen Fleishman who’s a good friend. My creative director came to me and he says, “This is how mobile app magazines need to look from now on. This is the future.” And there is nothing out there that makes this happen. Marco just coded this from scratch. So he said, “Why don’t we make a tool that will make this easier, not only for our clients, and then we could sell it.” I said, “Yeah, let’s do it.” We needed a name so we called it TypeEngine and we dipped our toe into the whole SaaS model of trying to run a product and we built up TypeEngine. We’re not marketing people. We’ve never advertised, really. We’ve never advertised for our consulting and we didn’t know anything about advertising. To be honest, we have never really advertised TypeEngine. I think we sponsored Tab Dump. You remember Tab Dump? Jamie: Yeah, we sponsored Tab Dump at one time and I think that was the extent of our advertising on TypeEngine, and that was it. So we built a tool that allows you to publish whatever you want to publish –internal maintenance manuals; catalogues – retail companies can publish their catalogues and it has got interactions where people can buy stuff through it. You can publish a magazine or a newspaper. People are using it to publish books like Book-of-the-Month Club through it. Yeah, it works great. Alexis: So I’m curious about the market for the tablet or web based – tablet magazines, that kind of thing. There was a big buzz about it with The Daily and this kind of thing. Even Engadget’s Distro, and then after some activity they kind of faded out. What are you noticing in that kind of space? Jamie: Well, what’s interesting is [chuckles] there’s a Twitter handle that I follow, it’s called @themediasdying. I always think about it when people ask me about the state of the industry. I’m not a publishing expert; I haven’t been in the publishing industry for decades or anything. But what I’ve observed is that the big old stodgy publications that are out there, that are what we think of when we think of magazine and newspapers, they’re struggling. They’re struggling with the whole subscription model, they’re struggling by trying to get their mind around the fact that delivery and owning the delivery channel is not the big thing anymore, but the fact that good quality content, bespoke content is where it’s at, and that people actually pay for them, things like that. That’s one thing that really affected TypeEngine. I mean, we’ve had every big magazine company that you can think of come to us and asked to work with us a little bit and then kicked the tires on TypeEngine. But when they see how we have embraced mobile first and the fact that most specifically, when they see that we have adopted the whole responsive design thing, that the layout of a publication cannot be lashed to the content itself, that the layout is not part of the content specifically, they just back away because for so long –. I mean, since Gutenberg, the actual layout and composition of a publication has been intrinsically linked to that publication’s brand and the content. I think there’s a lot of history there and a lot of muscle memory that the industry’s get to need to get over before they can really, really adopt a good content strategy for mobile. The big ones out there, they’re not doing it. They’re very, very, very slowly moving over but what you see is much smaller publications and newer publications, perhaps people with forward-thinking new media directors that are really trying to do it. We’ve met with every name you think of and many of them are struggling, but it’s the smaller ones that are killing it. So yeah, we’ll see. Alexis: Now, you mentioned moving into the SaaS pace was a new thing for you. With that comes the pricing horror, depending on your outlook on it because most, if not all, of the developers that I have spoken to have shuddered when I’ve mentioned the word ‘pricing’. What is your experience with the pricing? Have you learned any lessons that other folks might benefit from? Jamie: Yeah, it’s terrible to try to come up with a good pricing model. We experimented with a couple of different things. I’m a simple guy and I find that simplicity usually wins and I was right, and I was wrong at the beginning to try to come up with pricing models that were complicated. The simpler the pricing model that you can come up with, the better, is what I think. Even if you can just come up with a straight monthly fee or just a straight licensing fee. Whenever we got involved with, “Oh, this many downloads per month or this amount of bandwidth per month,” you’ve got accountability issues where you have to prove to your clients that you’re billing them for the right stuff. It just got really crazy and eventually we actually just backed off of the whole thing and just said, “You know what?” When companies call us now and they say, “How much is it for TypeEngine magazine?” We just say, “It’s this much upfront and this much per month.” That’s it. That’s it. It doesn’t matter if you have five subscribers or 50,000 subscribers. Our life got measurably better when we adopted a much simpler pricing model. Alexis: I’m curious because there must be the instances – because bandwidth is a real thing. Are you okay if it turns out to be that you’re spending more on bandwidth on certain months and you’ll just eat the costs that way, or did you make sure that it will be pretty damn hard to reach that cap where it would kind of sting? Jamie: Yeah, we made sure that unless we get Time magazine, we’re going to be okay. In the cases where – in fact, we actually have spoken to Time magazine – and in those cases where we talked to Time magazine or Popular Science, we just tell them, “You know what? You guys are so big that you should actually have a self-hosted instance of our entire system.” And then, in that case we just license our entire system front end and back end to them and we helped them set it up on their own, self-hosted, and we just charge them a license fee. Alexis: It’s a great angle to look at it; it’s something I hadn’t considered for SaaS apps before, really. Jamie: Yeah, it just side-stepped the whole bandwidth thing. Alexis: Yeah, like a hosted GitHub kind of thing. Alexis: Jumping back to the Smyth Group, how do you identify good clients? That’s one of the challenges that folks or agencies and even freelancers that go through many clients every year. They always have to pick and choose their clients. At least one, they get really busy that they can’t handle everybody. How do you understand, “Okay, this is somebody or this company is one that I want to work with”? Jamie: For us, the way to find a good consulting client is – there are things that I look for upfront. Are they devoting somebody besides the CEO to this project? Are they actually willing to appoint a media director, a project manager? Are they willing to put skin in the game besides money? Are they willing to actually devote their time to this project? Because the worst thing for us is we take a client, we take a project and then we are in a vacuum and we’re trying to get answers. And as I said, we do genuinely, honestly care about our clients, want them to succeed, but they’re not devoting resources of their own to the project, to give answers and things like that. Generally, that’s a bad client for us. We look for somebody who – we meet with an executive, they interview us, we interview them, we all like each other and we agree that we’re going to do this project, we get a loose scope from them. And then we ask them, “Ok, who’s going to be in charge of this project form your side? And it can’t be you, Mr. CEO.” If they don’t have a great answer for that or if they’re not willing to come up with a great answer for that, then we usually walk. That’s one of the things. There’s other financial things. There’s companies that don’t pay their bills and we’ve come up with ways to vet those guys out, because obviously, we only want clients that are willing to pay their bills. And that’s that. We also look for clients that are – I’m going to use a buzzword, don’t run away – we look for clients that are willing to work in an agile way with us. Usually when a client asks us – they draw at the back of a napkin and they say, “How much does that going to cost?” If they are not willing to have a conversation that involves acknowledging the fact that it’s basically impossible to come up with a fixed scope of a project – I mean, we usually work on multi-month-to-a-year projects. If they are not willing to acknowledge that, it tells us that it’s going to be trouble, and in that case a lot of times we’ll walk on that as well. Because they have unrealistic expectations of how complex and how fluid a software development scope is. A project like that is going to go down. So that’s another thing. Alexis: I’d say that the contact – looking for who your contact is going to be and it can’t be the CEO is a fairly unique way of vetting your clients; it’s one answer that I haven’t gotten before yet in 30-something interviews so far . Alexis: Hey Johnson, you’ve got the Smyth account and I got to talk with them. Make sure this gets over the finish line. Jamie: We’ve had to staff up. We actually have two divisions in the company now. We have a division of people that just take care of TypeEngine and then we have a division that takes care of all of our consulting endeavors. There’s a general manager for each division that runs those. So to a large degree – a large degree, not a hundred percent, but we actually separate our people between those two concerns – if something technical comes up and we need to go build a new feature or something, then I’ll actually cannibalize some tech guys from our consulting side to go over and help out on TypeEngine. But for the most part, they’re separate. Alexis: Alright. Let’s start to wind things down here. What’s one mistake you rather not repeat? Jamie: [Laughs] Oh, man. One thing I’d rather not repeat – there’s a bunch of them, Alex. One of them, I would say, is hiring your own people. I haven’t had horror stories; I’ve heard of horror stories but fortunately I don’t have horror stories. I do have a couple of sub-par stories where my gut was telling me not to hire this person but I knew them and I was in a pinch and I just stretched and hired them. It was a mistake and I refuse to make that mistake again. For the most part, I only hire people that I actually know. I know that doesn’t scale, I know that wouldn’t be a Fortune 500 company and I wouldn’t work at that level. But for the most part I only hire people that I know and that I already know are awesome. There’s only 24 people in our company that works for us. The way that I bring people in is I make them talk to people in my company, and if anyone of them comes back and says no, then it’s a no – pretty much no questions asked. A bunch of the stuff from Joel Spolsky’s book on Smart and Get Things Done, which is a fantastic short read. But yeah, I would say that the mistake I’d rather not make again is just hiring your own people when my gut was telling me no. Alexis: I have to ask, related to that question would be, how did you handle the “I’m sorry but you didn’t work out”? Alexis: On the flip side, what’s one decision that you’re pretty proud of? I’ve never lost a client because of that. I’ve never, not that I know of, not gotten a client because of it. But I think it’s the future, to be honest. I think that it breeds that right type of atmosphere that we like. It gives us tons of flexibility, it makes sure that the people that work with us are happy. They’re able to go where they want. If they want to go Costa Rica and go surfing and work form Costa Rica, we just ask that they have a quiet place to work and a good fast internet speed, and that works out great. It works well for us. I’m proud of the fact that we’ve stuck with that. Alexis: As somebody who’s been a remote worker all their working lives so far, I quite like that set up. Anyway, I still haven’t made it to Costa Rica though, I should. Jamie: Oh, you got to go. Alexis: [Chuckles] Last question here – when you’re coding, what’s your favorite text editor of choice? Jamie: [Chuckles] ADAM, I think. Jamie: Yeah, I like ADAM. Alexis: I think you might be the first ADAM convert on the show. Jamie: Yeah, I like it. Alexis: So if folks would like to learn more about The Smyth Group or TypeEngine or even follow you on Twitter and find out what you’re eating for lunch, where you’re travelling, where can they go? Jamie: They can go to http://thesmythgroup.com/ or they can go to TypeEngine.net and find all about us. If anyone wants to send me an email, my email address is jsmyth@thesmythgroup.com and we can chat. Alexis: For us, you can find us @Binpress and myself, @alexissantos. Jamie, we have made it out the other end of a tight 45 minute interview of which I would have really liked about two other hours to ask you about everything. [Chuckles] But maybe we can put you in on another show. Jamie: Absolutely. It’s been a real pleasure, Alex. Thanks a lot for inviting me. Alexis: Likewise. Thanks for making the time for us. And for the listeners, we’ll catch you next week!